“Cross My Skull Hope To Die” boyfriend women’s board shorts. These board shorts are cut specifically for a woman’s body but made to look like your boyfriend’s with the Fighter Girls look you love with a more relaxed fit. Great for MMA, grappling, wrestling, boxing, Muay Thai or any water sport of course. “Cross My Skull Hope to Die” board shorts have a skull and crossbones pattern in black and white featuring your favorite Fighter Girls face logo. Her mischievous smirk tells your opponents they better cross their hearts and hope to die, cause you’re sticking a punch in their eye! I got these shorts from my boyfriend for Christmas and just fell in love with them. They fit so well. They fit like it was maid for my body. I have bought shorts from other places and they always make be look awkward but these seem to hug my body specifically made for a girls body. I wear them to all events that I just placed a order for another 2 pairs. I got these shorts and when I tried them on I loved the feel of them, a good length even for my short but bulky legs! I have get a smaller pair though, so if you think you are in between sizes, go smaller, you don’t want them to pull off during roll time! These are my favorite shorts. The fit is spot on, they feel mega comfortable and durable, and yet manage to pull off looking awesome at the same time. Win, win. It was my first experience in these kinds of shorts and I’m very impressed! 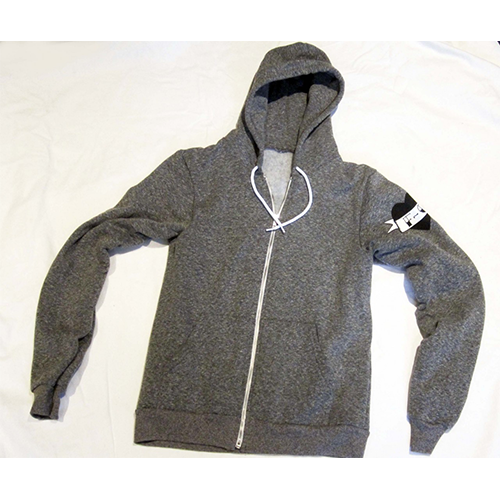 Very comfy and snug. I can do my kicks and shrimps without any discomfort. One thing i’d like to mention is the size. I don’t think 304 styles are that small. I’m between 5 and 6 (more like 5 these days) and I bought a 7. It’s ok now with but if I lose some more weight, it’ll run large for me. I am 5′ 4″ and weigh around 128 lbs. I ordered size 9 after reading reviews but turned out I should’ve ordered size 7. I was to go on a trip to France the day these arrived so I sewed both sides of the waist to take about 2 inches in. I’m a fairly large build (hey, good quads & glutes take up space) so always struggle to find training shorts that don’t either have miles of excess fabric that bunches up or too tight to train in. These shorts fit great, have loads of stretch and the construction is strong enough that I’m not worried about a blow out during training. They’ve also got a load of compliments on the awesome design. Ladies its tough shopping for shorts for that next body combat or crossFit competition or class looking through the websites trying to find a cute pair of women's workout shorts is tough most companies just make one style for men and market it a unisex short to sell to the women and girls! 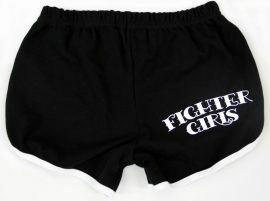 Fighter girls have been producing some real cute and tough shorts for women and girls since 2001 and only cater to females! We know that male and females have totally different bodies and ladies you don't want a baggy short with a huge crouch area like the men do right? Better yet would you want to be at your next workout class with the same shorts on as the guy next to you? I am sure that would be embarrassing. Come see what the Fighter girls brand have to offer for women and girls who don't want to look like a guy! Our store only caters to females so shopping will be fun and easy! 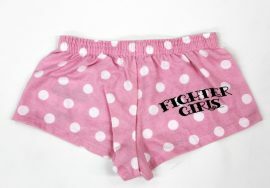 Please feel free to read our reviews that the customers have to say about the Fighter girls clothing line! Train hard ladies and look great in our clothing and gear!